Hello, sweeties! I just wanted to share this post with you all today to showcase another one of the FABULOUS Sweet Cuts sets just released this month at Paper Sweeties that I kind of failed to adequately showcase in my previous Paper Sweeties posts this month. And let me assure you....this new Scalloped Square Frames Sweet Cuts set is one you'll NEVER want to neglect. Like all of Paper Sweeties' products, they're adorable and super versatile. This sweet set of three sizes of Scalloped Squares Frames Sweet Cuts can be used in so many different and fun ways. I used mine at the top of my card by cutting two of the smallest size frames from two patterned papers, and then alternating the inside square from each cut. Then, I added a couple of Sugar Sprinkles Sequins to the Scalloped Square Frames Sweet Cuts. On the bottom of my card, I cut several different borders from the super Sweet Borders set. I used different patterned papers to cut scallop borders, a heart border, and even banners/flags from this adorable Sweet Borders set. I just LOVE it, and use this set all the time. In the photo above, you can see these ADORABLE Sweet Cuts. You'll also notice that I put a Bubblegum Paper Straw across my card, and that's where I attached the heart border from the Sweet Borders set. Aren't they precious? Cute, cute....cute!! I just LOVE Paper Sweeties. This last photo really shows you how SUPER CUTE the banners in this Sweet Borders set. They have adorable faux stitching/indentations and are just SO cute for making sentiment strips, or just as little accent tabs as I did here on this card. I also added one more Sugar Sprinkles Sequin to the banners. 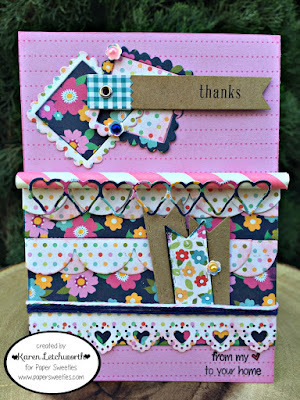 They're such a sweet little kiss of an accent to make your cards and projects extra sweet. Thanks for stopping by today to take a closer look at the Scalloped Square Frames Sweet Cuts. Along with all the other fabulous stamp sets and Sweet Cuts from the April Release, you won't want to miss out on stopping by Paper Sweeties. 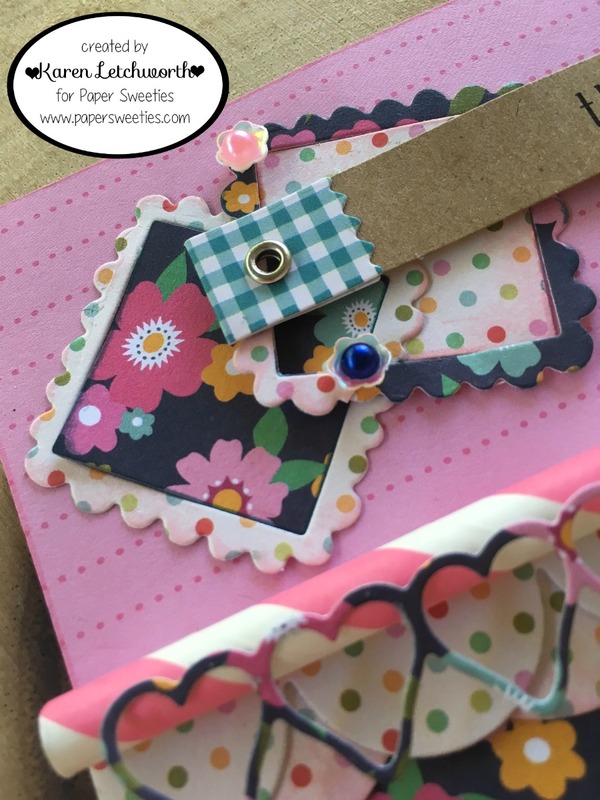 There's also a fun challenge taking place on the Paper Sweeties Blog. Karen, this card is so fun. 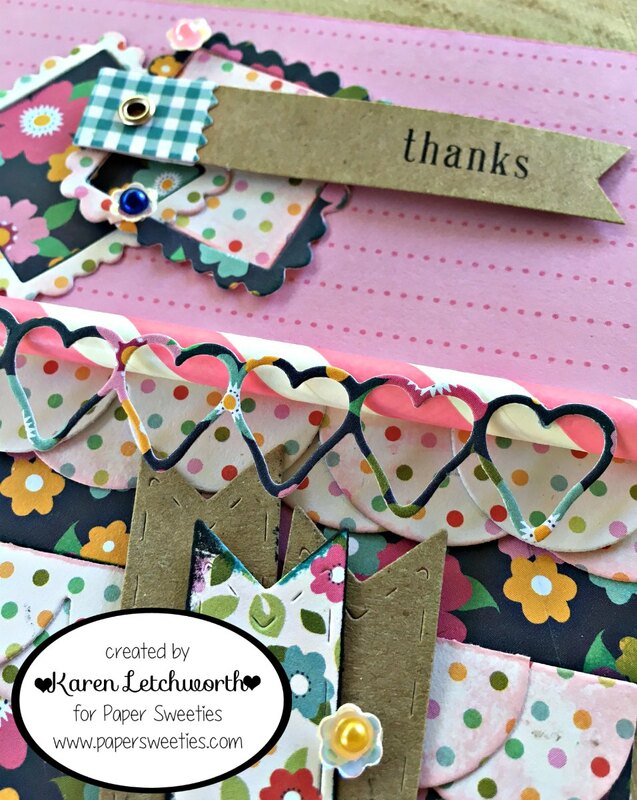 Love the straw in your card along with all the other details!!!! Such a super cute & fun card! !Love the fun die cuts! Very pretty card. Great colors and love the heart die on the colorful straw. I love all the dies and card layout.